The results of the PHP Programming Innovation Award edition of 2015 were announced and the winner is Dave Smith from United States. Collectively United States won the championship by countries thanks to the contributions the year of Dave Smith, Matthew Knowlton, Nick Daniels, Asher Wolfstein, Jack Peterson, Matthew Boyle, and Richard Williams. The site interviewed the winners to know them better. Listen to the winner interview or watch the interview hangout video, and read the interviews with the United States team winners to learn more about the outstanding innovative packages that allowed them to win the 2015 award and how they can be contacted in case you are interested to hire them. Dave Smith is a 50 year old PHP developer from the United States that has been programming since he was 10 years old. 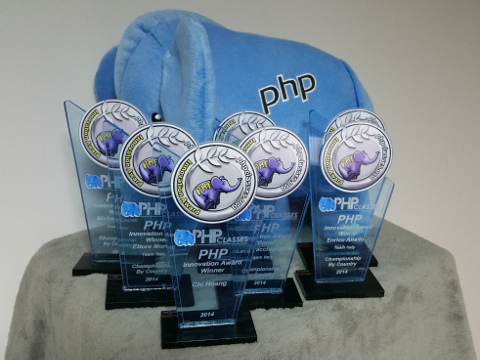 He won the 2015 PHP Programming Innovation Award edition with 16 nominated packages and 143 points. He actually submitted more packages in 2015 but not all were considered innovative. Dave also helped the United States to win the PHP Innovation Award championship by country of 2015. Dave Smith is available to be hired by companies interested in a developer with these skills. Interested companies should send a message Dave using his contact page in the PHP Classes site. You may find more about his story and the nominated packages in the interview below in this article. Here follow interviews with PHP Innovation Award nominees that helped the United States. Can you tell a bit more about yourself? I mean, where did you come from, where do you live, and what do you do? I am currently living in Kansas City, MO USA and I'm looking to travel. I am working as a freelance programmer. Do you plan to send more innovative classes soon to the site? What are your plans? Yes, I do intend to submit more classes to the site. Do you think this Innovation Award will help you get better opportunities or you are not sure? Yes, I do. It's nice to be able to send clients to this site. If there are any companies, anybody listening to this interview that would be interested to hire you, maybe that you can use your classes to help in their projects, how can they can they contact you to hire you? By my professional profile at PHP Classes. Can you tell a bit more about yourself? Where did you come from, where do you live, and what do you do? A little about myself, I come from California, USA. I am into computing and am self-taught security novice/expert. While holding a semi-part/full time job as a security analyst which envolves several aspects, ranging from security, to vulnerability mitigations and analysis. Can you talk about briefly about each one of your nominated packages and why did you develop them? PHP IRC Server - One day, I thought to come up with a PHP variant of an IRCd server, while using such IRCd services for a lifetime, I come up with this PHP IRC Server. While I have more ideas for this, I am currently siding whether to do or not to do. Meaning there are several factors in order to do so. Though I may indeed, adapt. As I soon got the criticism I further improved this class. With help from Dave, and to the extent of making it perfected to a point. PHP CloudFlare Resolver - This class, was one of my first, I suspect. Which I thought nobody else would've submitted to PHPClasses, my inspiration was several unreleased Cloudflare resolvers in which had been around. So I thought I'd have my own and submit to a known website, namely being PHP Classes. I do plan on submitting more innovative classes, however; it comes to the point whether I have the time at present, while I come up with ideas, I shall post more. Until that time I can only hope they're innovative classes. To be fair, it could get me better opportunities, however, I am not sure, also whether it could. But I have ideas that it could in the future. Can you tell me one thing that you like about the PHP Classes, one thing that you would like to be improved, and one thing that you think it is missing and you would like to be implemented in th site? To be honest, I haven't any idea what to improve, nor do I have any problems. While the site as many sites could do with improvement. I am not the one to ask for improvment advice. If there were any company at all, that wanted to contact me, they could do so through the PHPClasses Website, respectively. Would you like to say anything else that I have not asked? If anything, all I can think of is, thank you for the time, and patience. If anything else, there would be a big thank you for founding the website we currently reside on. I was born and raised in a semi-rural town up in the Rocky Mountains. It was a very small county. There was one stoplight for five towns, no book store, and limited libraries. I even raised 4-H sheep and swine. I taught myself how to program when I was seven on a TRS-80 Color Computer II 16k. It had no mouse, no hard drive, and barely an operating system. Growing up I was the only person I knew that could program computers for a very long time. I now live in Fort Collins, Colorado with my partner and my rats. Here I have access to the Colorado State University’s library, and other amenities of a city, like book stores. I have not gone to college, instead I teach myself how to do things by reading about them. I am currently unemployed, and spend my time writing, drawing, and designing computer games. I am interested in interactive storytelling and artificial intelligence. Can you talk about briefly about each one of your nominated packages and why did you develop them. I created phpizer when PHP’s object model as we know it now was just coming out. It was important to me to be able to program for both older engines as well as newer ones without having to drastically change your code. This would increase the compatibility of the script. I had an interesting time employing the regular expressions necessary for the class, particularly the recursive regular expressions. I created the PHP Enum Data Type when I found PHP lacking any type of formal enumeration data type. I’m interested in programming abstractions, like design patterns and abstract data types. At the time I was developing my Abstract Data Types package and needed a way to quickly construct a class with enumerated constants. The code generation was interesting to me. I was inspired to create PHP Configuration Trait because I am intrigued by the idea of traits and what they can do. It seems to me that many objects have similar functionality, and instead of create an additional library with interfaces, we can inject simple logic straight into a class. When I was developing Abstract Data Types I needed a quick way to configure objects. I’m not sure what my future plans with the site are actually. I do plan to send more classes as I am inspired to make them, however, I never really know when that’s going to be. Programming wise I’m extremely interested in artificial intelligence, and on that note, algorithms that operate on abstract data types. As I read more about graph theory and artificial intelligence systems I’m hoping to expand my repertoire as a programmer, and these I will upload to the site. Currently my time is divided between learning about additional programming and designing an adventure game. I believe it would help me get better opportunities, however, I’m not really looking for better opportunities. It’s something that I can point to and say, “See, I have programming skills.” which is important because I’ve never taken a programming class in my life and don’t have the credentials to prove my skill. I like the PHP classes ability to market my classes in a somewhat indirect way. Not only does it allow my code to be reviewed by a community of PHP developers, but it also gives me a place to point people to my programming work. Other sites also distribute data about the site, and my byline appears in multiple places on the internet. One thing I might improve is the file uploader to make it more user friendly, but, it works well as it is now. It would be interesting if we could have a longer about page for a package, like a README in markdown format. That way there’d be a small description, and a longer description. But I understand the blogs are also meant for this, and I may be missing something. I am available primarily through email. My email is asherwunk at gmail.com. I love programming, and do it even when I’m not being paid. I grew up programming, and it’s something I ha’ve done my whole life. I originally grew up in Sammamish, Washington. While not formally degreed in computer science my degree is a B.S. Finance and Accounting, Ive been a passionate php developer for a number of years. Presently Im employed at Dealer Inspire, Inc. as the Senior Vice President of Engineering. Most of what I do is a blend of systems operations work and some development when time permits. Dealer Inspire creates websites for automotive dealerships and Im enjoying my time there. There always seem to be new and interesting projects to focus on. Immutable state status tracker was created as an open-source contribution to help solve an internal problem that we were facing. Because the problem of managing the state of distributed jobs is no easy task I figured that this would be useful to the broader PHP community for those who need to manage multi-step jobs while also needing to be able to report on the status of a job at any given point in time from any other worker whether on the same instance or another instance. Our specific use case was around speeding up image processing within our larger inventory processing system. We were hitting the limits of a rather large system and needed to place workers that can compute this work in parallel and in a more scalable way. I have a few other ideas up my sleeves; however, getting code ready for the public is a bit involved in terms of setting up unit testing, automating builds, and so forth. Time is always the biggest blocker to being able to produce code ;-). Well, honestly Im not looking for anything at the moment employment wise. This was just something that I contributed to help others solve a problem where I found other solutions lacking or unsatisfying. This just happened to be my first open-source project that Im running from end to end and promoting. Can you tell me one thing that you like about the PHP Classes, one thing that you would like to be improved, and one thing that you think it is missing and you would like to be implemented in the site? PHP Classes seems like a pretty cool community in terms of being able to find useful scripts. If I were to change anything it would be easing the github / composer integration. The site seems to cater to an older style of PHP development from the pre-composer days. Then again, communities are frequently a bit slow to adopt change. The best way to reach out to me would be through LinkedIn or on GitHub with respect to this class. I live in Michigan. I've been coding for 10+ years. I worked freelance for several years while also teaching, I now am working full time as a developer. Vudu is the only package I submitted last year. I sends XML over a socket to execute control commands on a Vudu set top box. I learned the XML commands from looking at the files for the Duet remote which were available as a download from Vudu's website. I do plan on submitting more classes. I have recently had a second class approved. I have two or three more that I am thinking of posting. I have found some great resources on this site and am happy to contribute code of my own. I am not sure how much of an impact the Innovation Award will have on my professional life, but I am happy that people appreciated my class enough to vote for it. PHPClasses is a great resource, most tasks that I come across in development are things other people have already encountered and many are willing to share their solutions on this site. The site functions well, but it does have an out of date appearance. This email matt at northsidedigital.com is probably the best way to contact me. I'd just like to say thank you. Manuel, your Web site and the effort you put into managing it is very much appreciated. ​I have a PDO class that adds a nice layer that works with MySQL or Sqlite. I've looked at most of the other PDO ​and they work only with MySQL. This class not only works with both DB's but adds a few higher level functions like some of the other classes do. Also I have a CSV/TSV reader/writer class. This class will take a column delimited file and can perform editing operations on specified fields. It can delete entire lines based on the contents of one field. I plan to upload these to Github and to PHPClasses in the next few months. ​I've used several of the available components from the site which saved me much time. As I recall, the docs for downloading from Github (etc.) are either not there or hard to find. ​I can always be contacted at richard at roguewavelimited.com​ .